Bore = The measurement of the inside diameter of a cylinder. Stroke = The distance a piston travels fro either the tip of the cylinder to the bottom or vice versa. The relationship between an engine's bore and stroke determine, to an extent, how it makes its power. For a given capacity, 'long stroke' motors - ie those with a relatively long stroke in relation to the bore size - will tend to be relatively low revving but with strong low down power, while 'short stroke' or 'oversquare' motors - short stroke with a wide bore - will be able to rev higher. And, because more revs equal more horsepower (horsepower = torque x rpm divided by 5252, so increase the revs and the bhp increases too), manufacturers are always looking at ways of safely increasing the upper rev limit of their motors. One of the major factors determining an engine's upper rev limit is piston speed. For every revolution of an engine, the piston moves up from the bottom of its stroke (bottom dead centre or BDC) to the top of its stroke (top dead centre or TDC) and back again. So in the case of the '04 R1, the 77mm wide piston goes from a standstill, travels 53.6mm up, stops, and comes back down again. At 10,000rpm it makes this journey just over 166 times each way every single second, at an average speed of 17.9 metres a second. 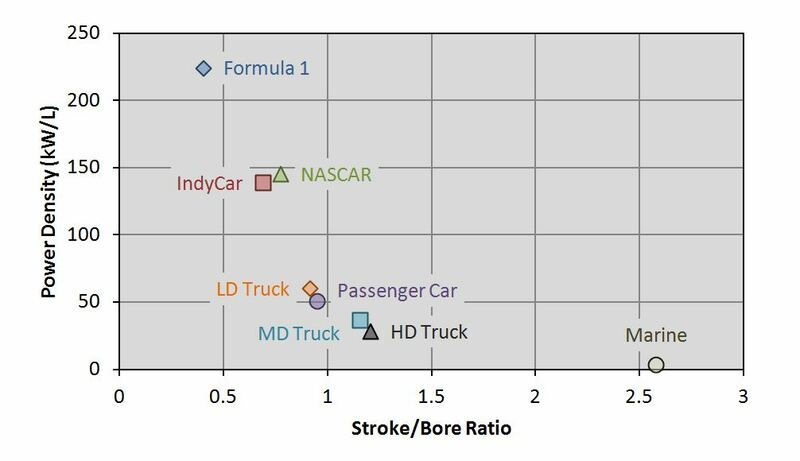 The ratio between bore and stroke can determine the general characteristics of an engine and how it behaves. The bore and stroke of the engine decides the displacement of the engine. The larger the bore and stroke, the bigger the displacement and thus a more power engine. An engine’s bore and stroke are generally chosen to keep the piston speed to a reasonable level (around 20m/s maximum for a road car, while race engines can generally sustain 27m/s or so). A big-bore, short-stroke engine will have the piston traveling a shorter distance than one with a longer stroke but smaller bore, and this will help keep the piston speed down. In addition, the bigger the bore, the larger the valves that can be fitted inside the combustion chamber, leading to potentially more air into and out of the engine. Because of the shorter distances a big-bore engine’s pistons have to travel, such an engine will tend to be quite free-revving and will make power higher up the rev range than an equivalent long-stroke engine. However, the long-stroke engine will normally be tuned to give more torque, for a given cylinder pressure, at lower engine speeds, since it will not perform as well as the engine speed rises. An engine that has a wider bore than stroke is referred to as oversquare or shortstroke engine. An engine that has a shorter bore than stroke is referred to as undersquare or longstroke engine. An engine that has an equal bore and stroke is referred to as square engine. 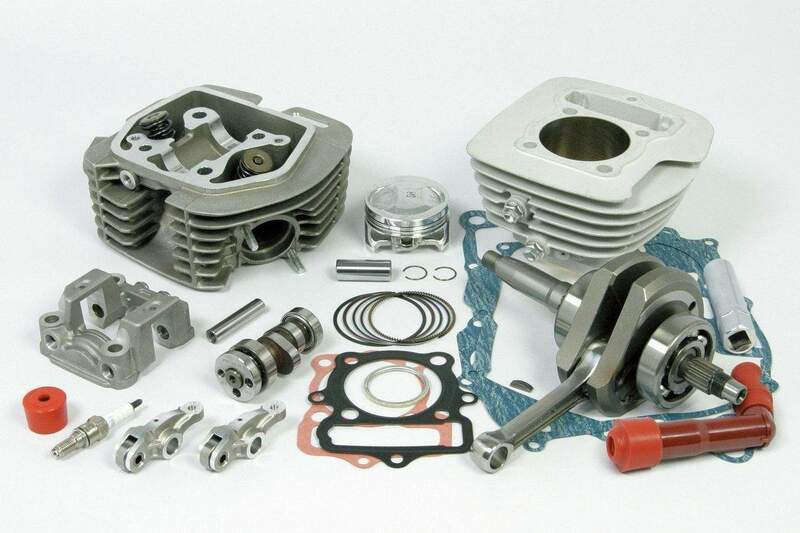 Usually engines that have a bore/stroke ratio of 0.95 to 1.04 are referred as square engines. B = √ 4D/(πSN) . These formulas are derived from the equation for cylindrical volume, V = πR²H.